County yearlisting can sometimes be a frustrating business. Not seeing birds you should be able to see easily (it took me a full 6 months last year to see Kingfisher) and also having to re-look for those hard to see species that can take a lot of time and effort to finally get a glimpse of. Chief among these is Bittern! Bitterns aren't that unusual in Northants during the winter but that doesn't make them any easier to see. I have been lucky enough in the past to have some good views in the county, in fact the best views of Bitterns I have ever had have all been "in county" with at least 3 on the deck but most of the views I have had elsewhere in the UK have been fly overs. So knowing this year I was going to have to see one to add it to the list I was very pleased when a bird appeared at Ravensthorpe Reservoir and seemed to stay in the same spot fro over a week. My mate John Friendship-Taylor had been texting me to say he'd seen it the previous day while I was on a twitch to see the Pied Billed Grebe so I got up early and arrived on site just after dawn. I had to wait a while, in fact and hour passed while I patiently scanned backwards and forward along the reed fringe, but eventually I spotted a movement behind the dead tree. The movement came closer and then a Bittern climbed up over a trunk and stood out in the open. Fantastic! What a view! It slowly moved it's head down to the water and tilted it's head to one side as it dipped the side of it's bill into the water and had a drink. I then had at least half an hour of incredible views as it crept around while snaking it's head around the cover to look for fish. I did manage to capture a video which I have included below, apologies for the shake but it's Iphone Digiscoped - it also comes more into view about halfway through and I recommend you set it to the highest picture quality you can too! After this successful start to the morning I then went over to Pitsford Reservoir to see what was about. I wasn't after anything in particular but after yesterdays twitching I had to an urge to bird a site for the rest of the day. I had a slow walk round the whole of the nature reserve and then after meeting up with John we had a walk around Maidwell but there wasn't much about of note, wildlfowl numbers had really diminished at Pitsford as the recent cold snap had covered a lot of the water with ice. The Great White Egret that had spent the winter here though did put on a real show as it flew up and down Walgrave Bay. It was a nice relaxing end to a manic weekends chasing rare birds. 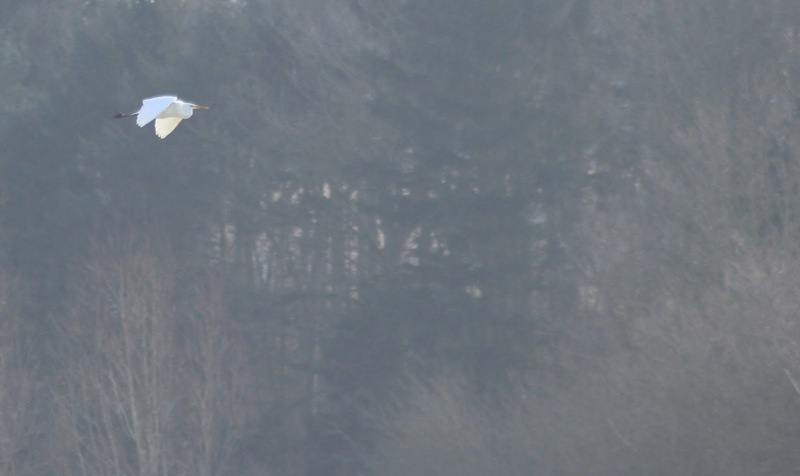 I'll leave this post with a pic of the Great White Egret giving one of it's many "fly by's" of the morning. Since returning from Scotland a bird has turned up in Britain that I have been very eager to see. As you may have read before I have a selection of what I call "childhood birds" that I have been wanting to see since I'd first seen them in the bird books I used to read as a kid. 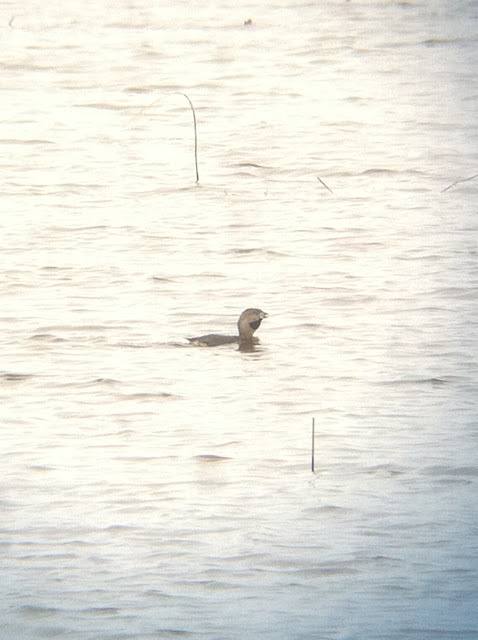 Pied Billed Grebe is one of them! The last close bird was the Manchester one a few years ago but a combination of an unreliable car and working full time meant that by the time I was able to go the bird had gone. So when a Pied Billed Grebe was seen at the Ham Wall Reserve in Somerset I was very keen to go. Only trouble is a touch of "deja vu" was reoccurring as my cars brakes had failed and were awaiting repair and the days at work were starting to mean that this may be another dip. Fortunately though a weekend was becoming free and luckily the bird was still there, also an email conversation a birding friend of mine who said he would like to see the Pied Billed too meant a trip was on the cards too. So on the Saturday of the 2nd of March Martyn Hopper picked me up from Northampton and we made our way to Somerset. We made good time to the reserve and after a few hours drive we were walking along the path towards the second viewing platform. Almost straight away we saw the Pied Billed Grebe on the far side of the lake and we had good but fairly distant views as it dived and swam backwards and forward along the opposite bank. Eventually it swam into the reeds and it looked like the show may have been over. Most of the birders left at this point but we decided to stay along with a handful of other guys just to enjoy what else was about. A Bittern was booming from the nearby reedbeds and as we were scanning through the wildfowl someone had noticed the Pied Billed Grebe had swam out of the reeds. As we all got onto the bird we watched it swim between the reed islands and then swim in our direction (there was an area of reeds infront of the watchpoint where we were standing) and as it did so it paused, threw it's head back and started to display! What a privilege to be able to witness this in Britain! It called a few times as it waved it's head back and forth displaying the black throat patch before swimming purposefully to the reeds in front of us and vanishing among them. 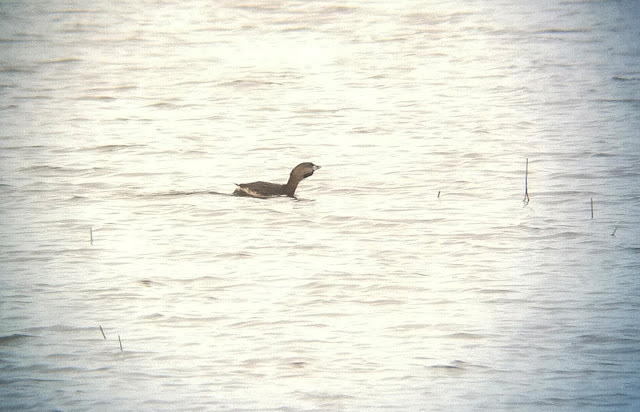 Here's a couple of dodgy record shots IPhone scoped during the display. 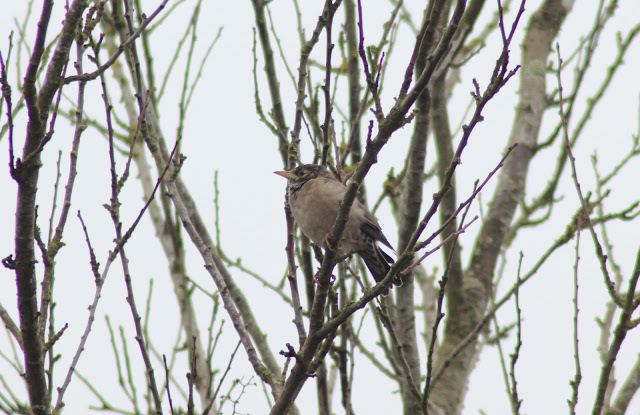 After having the best views we could have asked for we decided to make a move and head down to Exminster to see the Rose Coloured Starling. Once again the traffic seemed to be on our side and it didn't take long to get to the site. We parked at the bottom of Millbury Lane and walked back up the hill. Fortunately a few birders had beaten us to it and pointed out the Rose Coloured Starling perching on a branch in it's favourite bush. It was nice to see that it was moulting out of it's 1st winter plumage and into adult with a slight hint of pink in the birds feathers. It was fairly mobile and after it first flew we hung around for it to return, and when it did it helpfully posed for a few photo's. As we were in the area we decided to head even further south to try and find Cirl Bunting's. Luckily one of the birders at the Rose Coloured Starling was a local and he informed us of the nearest reliable site so this is where we headed. We arrived at Labrador Bay RSPB reserve and started to bird the area. A stubble field was next to the car park and we gave this most of our attention as we scanned the hedgrerows. The birds flock together in the winter so it was just a question of finding them but we saw very little as we walked along the south side of the field. As we were unfamiliar with the site it was a question of trying to find our way around and luckily we noticed a footpath heading north between the fields and it looked a little more sheltered from the cold wind coming in off the sea. As we walked along the path it became apparent we were heading in the right direction as the numbers of birds started to increase. 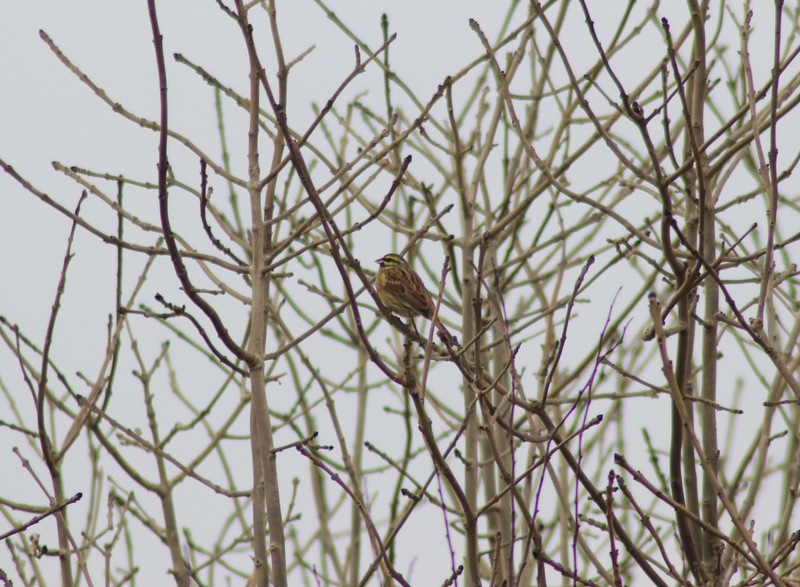 A flock of Linnets were doing the rounds and while looking at these the sound of a singing Cirl Bunting came from the corner of the field. We walked further along to be greeted by the sight of a few female Cirls in the hedge and eventually a male could be seen. Martyn picked out at least 4 males Cirls feeding in the field before they all flew into the hedge and we got great scope views with a couple allowing a few pics before they crept into the cover. It looked like we had got here just in time as the birds were starting to roost. 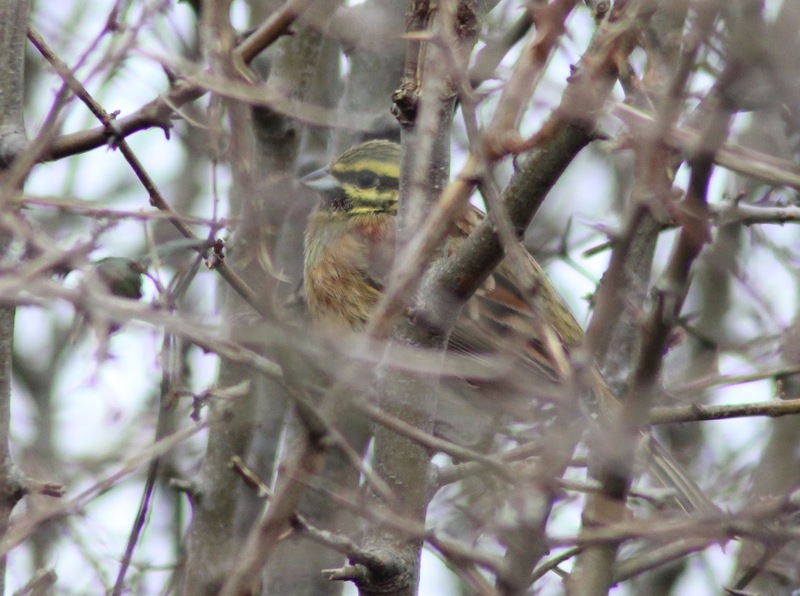 They all seemed to face into the hedge so their brown mottled backs camoflauged their brightly coloured faces making them very difficult to see once they'd settled down. In fact we saw a couple of walkers wander within feet of a few roosting Cirls without them moving a muscle such is their faith in their camo. I managed a couple of pics in the fading light. As it was starting to get dark we started the drive home. It had been an incredible day with the added bonus of getting another of my "childhood birds" ticked off - in fact it's just Bee Eater now to complete the line of birds I had always wanted to see when I was a child and never thought I'd ever be able to see for myself. Of course many thanks go to Martyn for taking me down there in the first place and for driving all that way on his own - I think all the coffee's we had en route may have helped!